As the cousin of Pro Football Hall of Fame defensive back Herb Adderley, Nasir was a three-way star in high school. When he joined the Blue Hens, he immediately entered the starting lineup for all 11 games and led his team with eight pass break-ups. The coaches in the Colonial Athletic Association voted him to the all-conference third-team in year two before making him a first-team selection these last two years. Since the start of the 2017 season he has led the team with a combined nine interceptions and broke up another ten passes, while also appearing in the return game occasionally. As soon as you put on the tape Adderley stands out because he just moves a little different than all those other guys in the FCS. He has been a fast riser in the pre-draft process, especially with a strong Senior Bowl performance, where he also had an interception in the actual game. 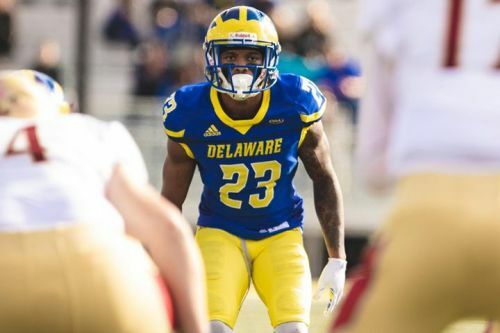 Adderley had two plays that went viral during his time at Delaware – the first was an incredible one-handed interception and the second a kick return where he trucked a defender, stared him down and then went on to take it all the way to the house. The talented safety shoots downhill against the run, where he sorts through traffic with bouncy feet and good balance. He puts a lot of receivers on their backsides trying to block him and doesn’t mind burying a shoulder into a tight end or even get into it with offensive linemen. Adderley shows off very loose hips when altering angles on the move. Usually he doesn’t get overly concerned with eye-candy and stays balanced. Adderley displays excellent form as a tackler, attacking low and shooting his arms when taking down opponents. His speed and hustle bailed out the Delaware defense a whole lot, taken sure-fire touchdowns off the board. You see him jump up after making a play and show a lot of excitement for the game. Delaware ran a ton of two high safety alignments, but they rolled into cover-three with Adderley playing deep more often than not. He has the range and instincts to play a true free safety role, which he shows off on several occasions, when you see him close out on deep throws outside the numbers. Adderley’s ability to track passes, his ball-skills and the way he attacks the ball at its highest point are all tremendous. When he can’t turn his head and has to make plays down the field or at the sideline, Adderley plays through the hands of the receiver and breaks up a load of passes. However, he also tries to take off the head of receivers in front of him and separates them from the football. When he has the ball in his hands, Adderley has the mindset of a returner and tries to make an even bigger play. He also has experience dropping down into the box and making receivers pay at the intermediate level. His cornerback background has helped him in man-coverage when lining up in the slot. If you need a statistic to show how dominant he was in the FCS – he allowed a passer rating of 1.3(!) last season. That’s just stupid. The only real question mark with Adderley is the level of competition he faced in college. A lot of those angles he took and those plays where he bailed somebody out or recovered on a play will definitely look different against the top-flight athletes in the NFL. When I watch him on film there are some inconsistencies with his reads and how he responds to them, plus I could see savvy quarterbacks in the pros manipulate him at a higher rate going forward. Adderley earned an elite grade for his overall game by Pro Football Focus. He has all the traits to be an interchangeable piece to play multiple spots in the secondary. Adderley has the physicality of a linebacker, but the range of a free safety. He is a true play-maker, is not afraid to get into the face of anybody and was one of my favorite players to watch in the entire draft.